Great, you are reading this, so you have made it through registration, login and enrolling to this demo! Congratulations and welcome to the crashprogram: Introduction to Using the Academy (IAD13025). (the alphanumeric tag is the a unique identifier of the course in the system). The area you are now reading is the Course Dashboard. Its the "header" element in all courses and contains resources that help you make the most out of your course. One of the most important resources in the Dashboard is the Course Factsheet which is linked below. Why don't you go ahead and check out the facts about this course and then come back here? Good. You may have found out there are many ways to "go back". Clicking the browser back button, or by following links for the menu's to the right. Another typical Dashboard element is the Course Forum. This is where news about the course are announced so its a good idea to check when you log in. Why don't check to see what posts are currently available of the Demo Course? Other possible elements of the Dashboard are course specific FAQ's and - for more complex courses - suggested daily plans on how to tackle them. You are now ready to tackle the first block: why don't you click on Step 1? In the first (or orientation step) your learning target is typically to prepare yourself for tackling successfully the core course material. There is usually a suggested workplan, the course factsheet, a course FAQ and the Academy Manual. If you feel uncertain about any important aspect surrounding the course it is best to contact the instructor before starting the course. This demo this step takes you through the main navigation elements of the Academy. The "Step 1" block you are now reading is an example of a content block within a Course page. As mentioned above, in a regular course, this first step will typically introduce you to the key topics you need to master in the course, (your todo list if you wish). We next discuss the first two elements in our list: The front page and the home page. But before we get started, one more nagivation tip: Just to the right of the text you notice there is a checkbox. This is for you to keep track of which sections and activities you have covered. On the right are the menus with tools, links and other auxiliary info. It gives you access to some key menus which take you to your home page, you course status pages, calendars, FAQ's etc. As an example of a widget, in you homepage you get the Online Users widget, which - as name implies - tells you who is online. Once you go to your home page you can click the customization button at the upper left and customize the type and order of widgets you would like to have available. Don't worry about messing things up, you can always revert to the default configuration. Why don't you go and check out your home page and come back here when finished. This is as short "Academy Manual" that explains the Academy layout in some more detail. This is also an example of a resource available for download in PDF format. Feel free to download and use the Manual as complementary to this CrashCourse (always subject to the terms and conditions and respecting our copyright). We are done with the Step 1! The good news: We are already within a "Course View" as part of this CrashCourse and getting familiar with it. A Course is exactly this collection of views, activities and links that underping the learning of a particular subject. But we still need to learn some key facilities available within a Course. "Courses" within the Academy are flexible "units of learning" (modules) that can deliver a rich and interactive online experience. There are many possible configurations. We have been going though a CrashProgram format, which is designed to be a quick and dense learning experience that can be concluded in one "seating". Another major course format is the "DeepDive". As the name suggests, this is a course format that helps you cover a significant amount of material. It will thus typically be completed over multiple sessions (e.g., over the period of a week). The Central Column elements (Course Dashboard and the Content blocks - like the one you are now reading) should be familiar by now. 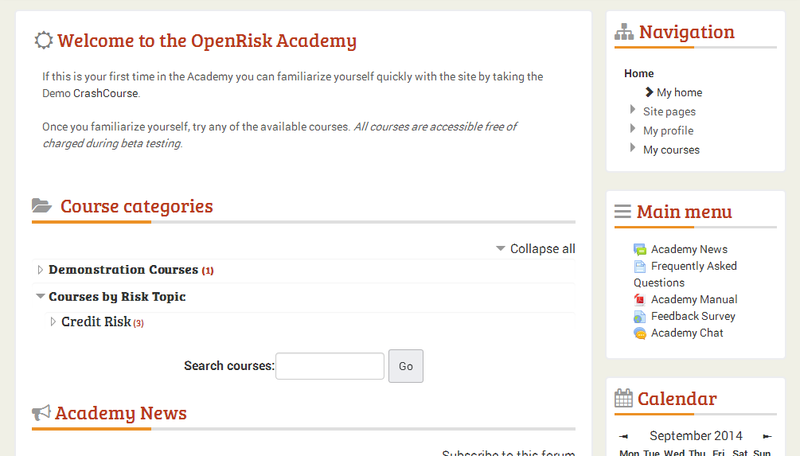 The Navigation Menu now includes a link to the current course. This link can be further expanded into a menu linking to the different sections of the course. At this point its time to get a first taste of more "interactive content". Click on the Lesson link below. This is a demo Lesson link. A Lesson is a self contained interactive unit of learning that requires you to react to the content by making choices or answering questions. You notice that the checkbox next to the Lesson is dashed instead of solid. This means that you MUST complete this activity to complete the course. We are done with Step 2 as well! Documents available within the Course as Assignments. This is your classic reading assignment. The Academy brings knowledge to life by making use of interactivities, specially constructed web apps that aim to help you to learn a topic in an intuitive and fun manner. Why don't you try out a demo interactivity by clicking on the link below! This is a demo interactivity. It illustrates interactive learning in a more quantitative context. The link will open in a new tab / window depending on how you have configured your browser. One of the main assessment methods used in the Academy are online quizzes. Depending on the course structure, the questions can be of a large variety of types (from multiple choice to essay questions). You can finish this Demo Course by taking the Demo Quiz below! This is a demo quiz. The subject matter is the material we just covered, the key facts about navigating and using the Academy. Now that you have completed the Academy Demo we would appreciate feedback on what you liked a lot and what you might have liked less! Well done! You are now ready to move on to all the exciting risk management courses offered by the Academy. Happy learning!